Poodle Pet's Flea Comb Puts The Ease In At-Home Pet Grooming Looking for the best dog flea comb to use when grooming your poodle or puppy? Searching for the best flea comb for cats or kittens with long hair, rabbits or horses? Tired of using kitty or dog flea & tick pet supplies that don't quite get the job done? Well, the good news is … Your hunt ends here. Poodle Pet has got the flea exterminator for you! We understand both pet owners, fosters & professional groomers need tools they can depend on. This is why we've carefully designed this ergonomic flea comb to universally meet their needs. ♦ Fast & Safe Flea Removal Ditch those chemical flea control products & get to combing! Designed to work on any type of pet hair, this mini flea brush penetrates fur to quickly & safely extract burrowed fleas & flea eggs. ♦ Rotable/Adjustable Pins Unlike other flea combs, this unique flea comb killer is equipped with rotating stainless steel pins. Simply pull them out, adjust them & space them according to your specific pet grooming needs. ♦ Non-Slip Ridged Handle Most common pet injuries during grooming can be easily avoided. Made out of plastic & outfitted with textured ridges, the handle of our fine toothed flea comb is easy to hold without slipping. ♦ Space-Saving Pet Tool The double sided flea comb is compact enough to store in your pet grooming tool box, bag or kit. You can also hang the small flea comb on a nail, knob or peg to keep it hung up & out of the way. DIMENSIONS: 8.5 inch handle length x 1.5” width GROOMING TIP: Dip the comb in soapy water between strokes to “drown” fleas & remove debris. It's time to get flea-free without the dangers of sprays, powders, washes & toxic treatments. Do yourself a huge favor & grab your gear. Order Poodle Pet Flea & Tick Supplies today! ROTATABLE STEEL PINS: Place the rotating stainless steel pins close together to easily remove flea eggs hiding out along your pet's skin & then space them out to exterminate pesky fleas from his or her hair. UNIVERSAL SHAPE/SIZE: Measuring 8.5" long & 1.5" wide, this pet flea comb is the perfect size to use when grooming just about any animal, including long-haired cats, small dogs, rabbits, horses & more. 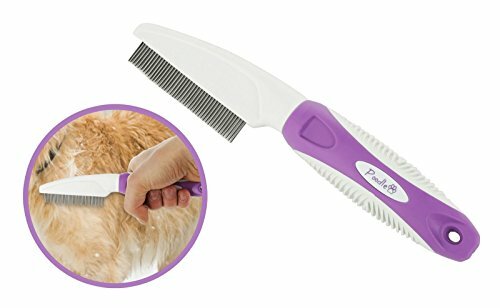 SLIP-PROOF, EASY GRIP: Highlighted by its ergonomic shape & ridged texture, the contoured plastic handle of the Poodle Pet Flea Removal Comb is easy to grip. No more slippery accidents! COMPACT, HANGABLE: The flea removal rake is small enough to be stored in your pet grooming kit or in a supply drawer. Finished with a hole cutout at the handled end, the flea combs can also be hung if desired. HIGHLY RECOMMENDED: Professional groomers & DIY pet owners choose Poodle Pet because our pet supplies are reliable, affordable & backed by a 30 day no-questions-asked, 100% money-back guarantee! If you have any questions about this product by Poodle Pet, contact us by completing and submitting the form below. If you are looking for a specif part number, please include it with your message.